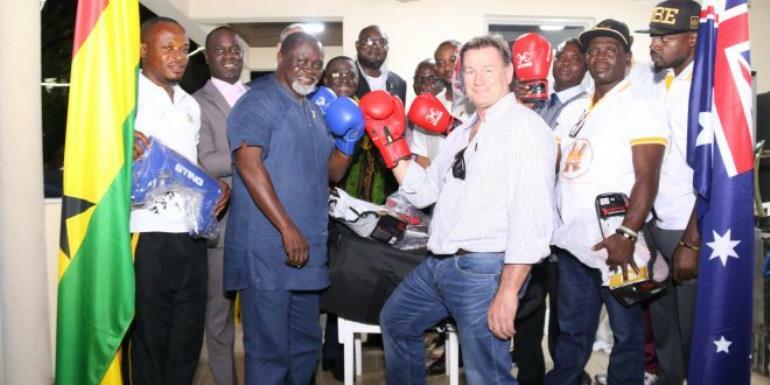 Boxing legend Azumah Nelson and Chief Executive Officer (CEO) of Geodrill Limited, Dave Harper have presented boxing equipment to the national amateur boxing team, the Black Bombers to prepare them ahead of the 2018 Commonwealth Games to be held in Gold Coast, Australia. The presentation was made as part of events organised by the Australian High Commission to bid Team Ghana farewell to the Games. The High Commissioner, Andrew Barnes said his outfit was thrilled to host the Ghanaian contingent as all the athletes have come together for Australia to experience their unique hospitality. He said, “all our embassies would be sending the teams off, which would give the various athletes a nice taste of what they should be looking out for in Australia”. According to him, some sporting disciplines like; swimming, hockey and boxing team can bring honour and medals to the country and raise the flag of Ghana high. On his part, the CEO of Geodrill also pledged that any Ghanaian athlete who wins gold at the games would be rewarded with US$10,000. He said they will set aside $10,000 each for individual athletes and team sports in any discipline that wins gold at the Gold Coast Games. “Ghana has won just a few medals and to encourage the athletes, I am providing an incentive which is any Ghanaian athletes that come back from Gold Coast with a gold medal, $10,000. That is the pledge of Geodrill,” he said. He also called on the athletes that will represent Ghana at the Games to give up their best and emulate Azumah Nelson in the 1978 Commonwealth Games in Edmonton. Ghana’s Chef de Mission for the Commonwealth Games, Sahnoon Mohammed, welcomed the news and expressed his appreciation to the company, urging Ghanaian athletes to prepare for the Games. Established in 1998, Geodrill Limited is a leading West African based drilling company with a fleet of 46 drill rigs that provides exploration and development drilling services to major, intermediate and junior mining companies with exploration, development and production operations.